Next to the very first Pemberton, whose name is yet to be determined, John Stith Pemberton is undoubtedly the most famous. This short treatment of him is drawn from a number of resources available on the internet including The New Georgia Encyclopedia, Wikipedia, and the Coca Cola Company. At 1,600,000,000 Coca Cola servings per day, it seems a typical English understatement to say that he has had an effect on the entire world. John Stith Pemberton was born January 8, 1831, in Knoxville, in Crawford County, Georgia to James Clifford Pemberton (born 1803 in North Carolina) and Martha L. Gant (born 1791 in Virginia). John was the nephew of the Philadelphia, Pennsylvania, native John C. Pemberton, the Confederate commander during the Union siege of Vicksburg, Mississippi, who surrendered that city to Union forces on July 4, 1863. More information about John’s progenitors can be read here: http://archiver.rootsweb.ancestry.com/th/read/PEMBERTON/2004-01/1073281384. We have not verified the accuracy of these reports of his ancestry. … Pemberton grew up and attended the local schools in Rome, Georgia, where his family lived for almost thirty years. He studied medicine and pharmacy at the Reform Medical College of Georgia in Macon, Georgia, and in 1850, at the age of nineteen, was licensed to practice on Thomsonian or botanic principles (such practitioners relied heavily on herbal remedies and on purifying the body of toxins, and they were viewed with suspicion by the general public). He practiced medicine and surgery first in Rome and its environs and then in Columbus, where in 1855 he established a wholesale-retail drug business specializing in materia medica (substances used in the composition of medical remedies) . Some time before the Civil War (1861-65), he acquired a graduate degree in pharmacy, but the exact date and place are unknown. In his day Pemberton was a most respected member of the state’s medical establishment, but his gift was for medical chemistry rather than regular medicine. He was a practical pharmacist and chemist of great skill, active all his life in medical reform, and a respected businessman. His most enduring accomplishments involve his laboratories, which are still in operation more than 125 years later as part of the Georgia Department of Agriculture. Converted into the state’s first testing labs and staffed with Pemberton’s hand-picked employees, these labs almost single-handedly eliminated the sale of fraudulent agricultural chemicals in the state and ensured successful prosecution of those who tried to sell them. Pemberton served with distinction as a lieutenant colonel in the Third Georgia Cavalry Battalion during the Civil War and was almost killed in the fighting at Columbus in April 1865. In 1869 he became a principal partner in the firm of Pemberton, Wilson, Taylor and Company, which was based in Atlanta, where he moved in 1870. Two years later he became a trustee of the Atlanta Medical College (later Emory University School of Medicine) and established a business in Philadelphia, Pennsylvania, where his own brands of pharmaceuticals were manufactured on a large scale. 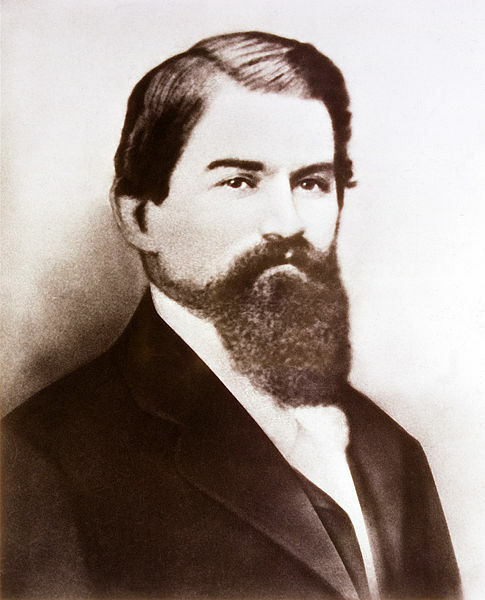 He also served for six years (1881-87) on the first state examining board that licensed pharmacists in Georgia.Pemberton was “the most noted physician Atlanta ever had,” according to the Atlanta newspapers, but he is best known for his expertise in the laboratory, where he perfected the formula for Coca-Cola. John Stith Pemberton was a native Georgian and his state has done a fine biography on him. To read the remainder of the article quoted above, go here: http://www.georgiaencyclopedia.org/nge/Article.jsp?id=h-2747. Here is a short historical video about John Stith Pemberton: http://www.youtube.com/watch?v=Q4mN1z7ny5E .